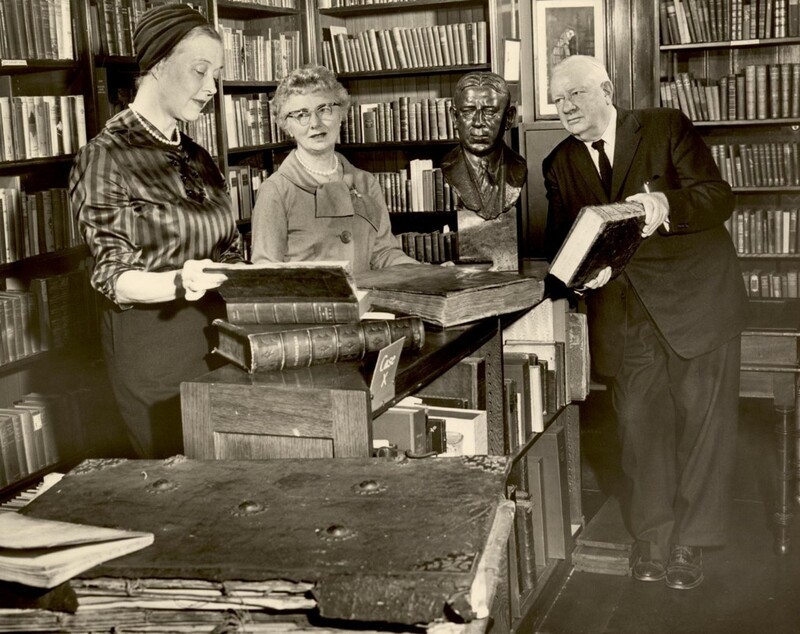 Librarians – let’s get out there! This is a transcript of the closing speech for the joint CILIP Ireland / LAI conference in Belfast in April 2015. Libraries – advocate and motivate! Many of us work in isolation and conferences like this are our only chance to meet the other people who work within our service. We are unlike any other industry in that we largely work alone or in very small groups. To be able to attend extraordinary events like this not only keeps us up to date with what is new and current in our industry, but it allows us to discover that we are not alone in our trials and our adversities. Libraries have never been at greater risk. Never. I have worked in libraries for over 27 years – through several restructures and reevaluations and reshuffles and several other things that regardless of the label hung on it meant job losses and a deterioration of the service available. This apparently was not enough and the erosion of the service has continued and has led us to this place where we are now. Thanks to the Seighart report we are now matched with railways and we are experiencing our Beeching moment. Actually, I think that this is an understatement. After Beeching it was still possible to catch a train, and the system is still recovering, but it is recovering. The same will not be said of libraries. When we lose our libraries they will be lost forever. This will be a single track line and there will be no recovering. No philanthropists will step in and rebuild. Losing our libraries will be an irreversible process. Of course our biggest problem is with governments and their inability to take the time to understand what libraries and librarians do and to find out exactly how important they are. This is largely because the people in power have a limited experience of libraries that is essentially an oak panelled silent room in their old prep-school or a silent brandy-fuelled room at the club reeking of aged and over-stuffed old-boys and cracked leather armchairs. They feel that it is fine to protect that sort of library, but do the poor and huddled masses really deserve access to that? One of the most crucial outward problems facing libraries today partially rests in the perception of libraries. There still exists a perception that libraries are a middle-class remnant of a stuffy past that has no place in the 21st century. If we step outside into the streets and ask people to describe what a library is there is a very good chance that people will still describe this…. Is this not what a library looks like? Why do we bristle at this statement – because we know it to be false. We know that when people think of libraries they really should be thinking of spaces like this. 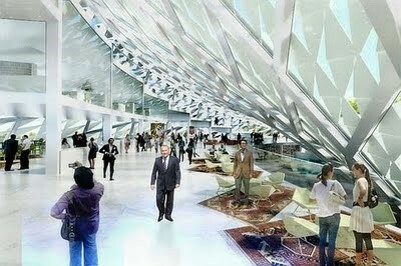 This is the plan for the new National Library of Kazakhstan and it is a far better illustration of what we know a modern library looks like. We have dozens of examples of such modern community hubs and we know that our libraries are essential and lively 21st century spaces that serve our communities (be they schools, universities or academic establishments) We know that our communities would be significantly less successful without our presence. We know this because we are in these libraries every day and we are able to track their impact. How do others know? What are we doing to ensure that the wider community is aware of the importance and impact of libraries? So often all that the non-library using public see of libraries is when another campaign starts. Campaigns do work, especially noisy ones, but the most effective campaigns are ones that bring to bear the power of hearts and minds. We can’t expect people who have never used a library to understand what a librarian does or what a library can do for them – we have to show them. We have to make our voices heard in a way that is positive and affirming. Use your users. One of the problems that we have with library campaigns is that it is often perceived as people just trying to protect their jobs – jobs that people do not understand or value. We need to better demonstrate what we mean to the people who use our libraries. Use your users to write about about what the library means to them, not what it means to you. A perfect example of this is the recent blog post at CILIP about prison libraries. Ex-prisoner Jonathan Robinson – a man who really understands how vital libraries and librarians are to the process of rehabilitation. How much more effective is it to hear the voices of people whose lives have been changed for the better by the support of the library and the librarian? We actually have no shortage of support, but it is directing that support to the right people that can make a difference. Find out who has the most potential impact in your field or your county and get them on your side. Use the famous, use writers, broadcasters, sports personalities, local youth workers, schools, anyone who can be useful to get the message to a wider and more responsive audience. Make sure that you are concentrating on the impact of the professional. Many library campaigns concentrate on the impact of the service, and not those delivering it. Talking about the professional is our job and we should be doing it as effectively as the campaigners are doing with the service. When you talk about digital literacy, make sure that you talk about the librarian that will deliver this service. It is not enough to save a library to have it staffed with volunteers, no matter how well meaning they are – this is not a sustainable system. Talk about the librarians and show why they are important. Stay positive. As library campaigners it is vital that we stay positive about the benefits and usefulness of a well-run library. As a life-long campaigner for change I know that the angrier the campaign, the less people listen. These are stressful financial times for everyone, and so people need to feel something on an emotional level to stand by you and make a difference. Yank those heartstrings with positive tales and case histories and show the benefit and wider value of your library to its users. Be seen! Be seen as an individual, not just as a faceless organisation. This is not just about a building with books in. A building with books in is not a library – no matter what the government would have people believe. You cannot run a library with volunteers – that is just a book lending service and that’s a completely different thing to a real library service. Make sure that people can see you and, in turn, that they understand what you do. Blog, tweet, facebook, speak, get out there! Join with others and support each other. Conferences are the perfect opportunity to network and to show support for others. Take every opportunity to forge new links and new bonds with anyone who does what you do. Show people what we do – show them that we are not just sitting there reading and waiting for a book to stamp out. Show people what you do in your service point and how you do it. So what do we do? Who are we? Why do people deserve a real librarian and not a volunteer? This slide explains exactly what we do and why we are so essential to supporting our communities. 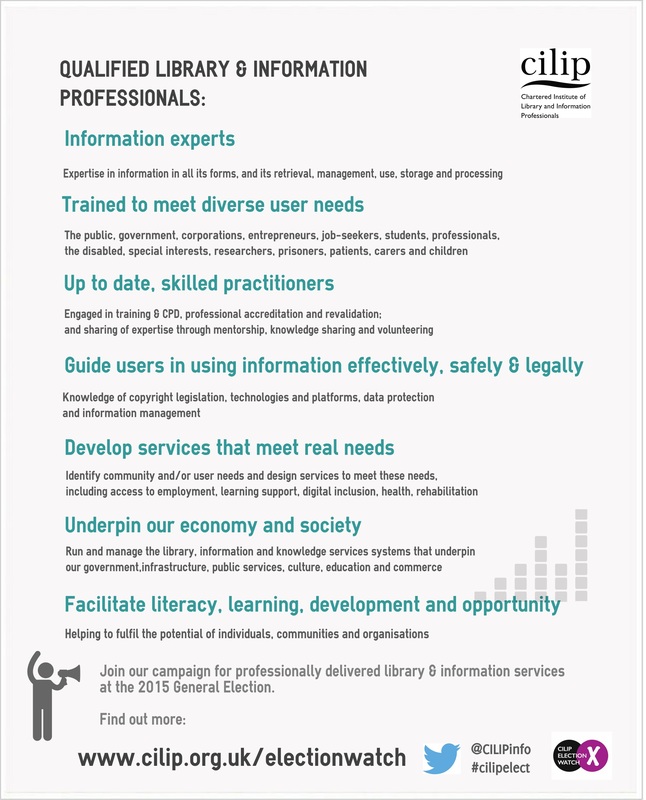 One of the key elements of the campaign to erase the library service relies in part on all of us in the profession having divisions. It relies on academic libraries not supporting school libraries, public libraries not supporting health libraries, legal libraries not supporting prison libraries. We need to unite to ensure that we are providing an intermeshed and overlapping service – one access point effortlessly linking to the next. Show your societal value. We do the most important job. We live in a time where the quantity of information available increases every second. With each passing moment the world faces another tide of information and only one sector of society can help to ride that wave and not drown. There has been a great deal of talk about the current government’s pledge to commit 7.4m towards wifi in public libraries and the campaign for digital literacy. We all know why this is so important. Those who are digitally literate have greater personal freedom and earn more. 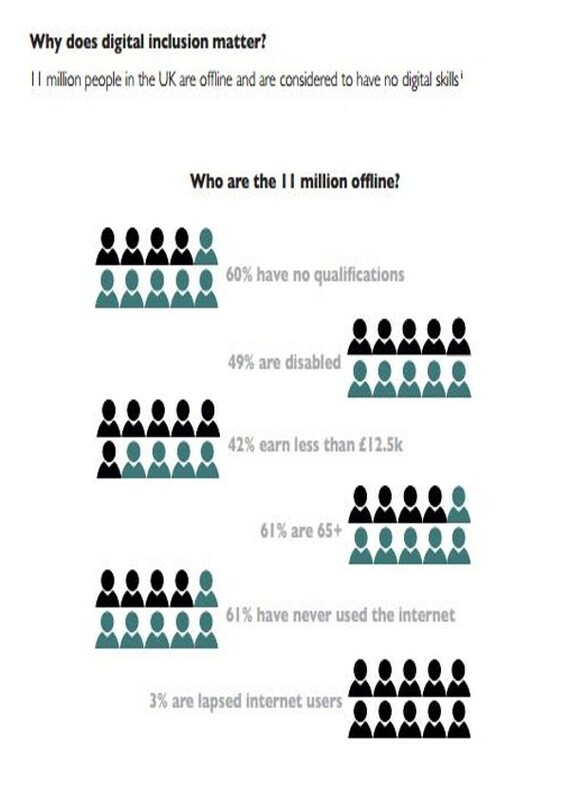 People with good ICT skills earn between 3% – 10% more than those without. 72% of employers would not even interview entry level candidates with no ICT skills. Who is at the cutting edge of this digital literacy revolution? We are the only ones in the right place to provide management of that knowledge in all its forms and to help people to access and organise it. We are all that stands between the population and fifty million hits on videos of cats riding vacuum cleaners. We are the information conduits, we are the managers of information and we need to make sure that people understand how important this is. These are dangerous times for libraries, librarians and for anyone who works in knowledge management. This is the time to represent a unified front. This is the time to unite and speak as one to stop the rot that threatens to destroy our libraries. If this destruction is allowed to happen, there will be no going back. If public libraries fall then there is a genuine risk that other information service points will fall in their wake. If we lose access to the unique skills that only a librarian can offer we will become weaker as a nation because of it. Stick together, build networks, cross services and make sure that people realise that this is not just about buildings and property assets, this is not just about wages or cutting costs for local government, this is about the professionals who provide a service that ultimately improves the quality of life for every single member of our 21st Century communities. 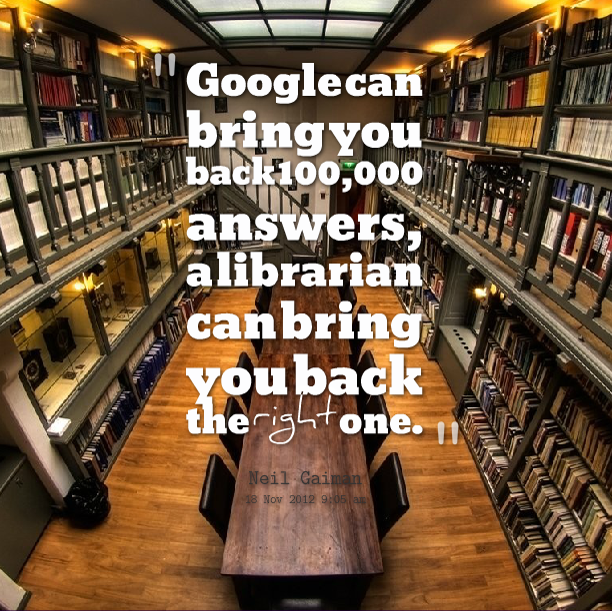 This is what truly makes a library – a librarian.